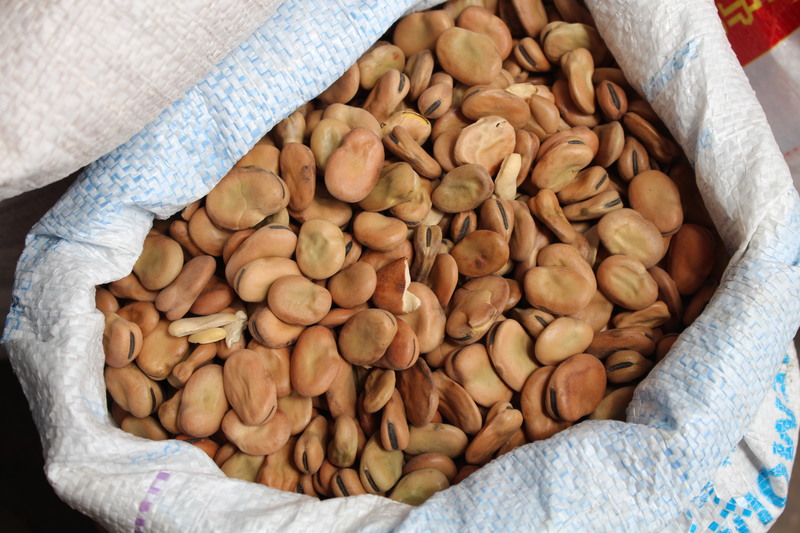 All the Makings of a Feast: Marrakech Medina | Oh, the Places We See . 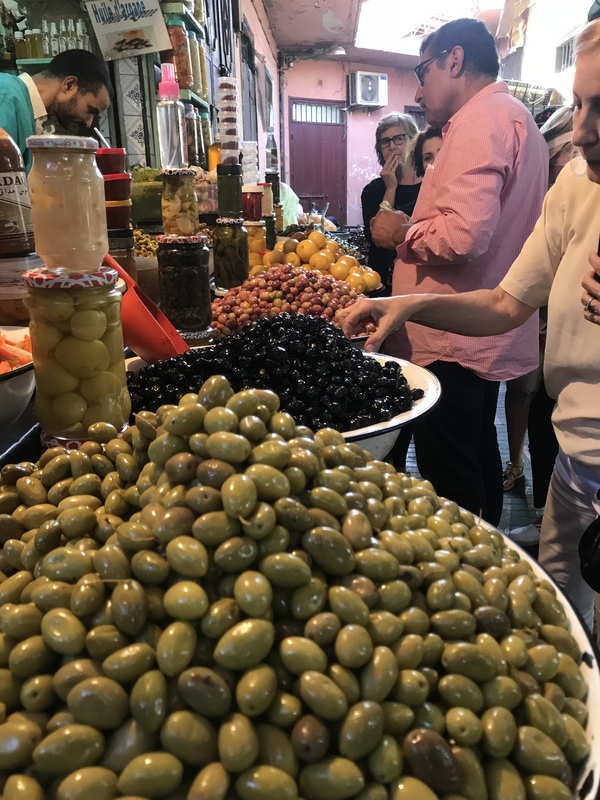 . .
No culinary experience in Morroco, especially Chef Joanne Weir’s Culinary Journey, would be complete with a trip to the Marrakech medina. It’s there that the freshest, most colorful foods are piled high for what is truly a feast for the eyes. And once you get home, the makings of a feast for all! It begins outside where donkeys and carts of all shapes and sizes bring in the goods. 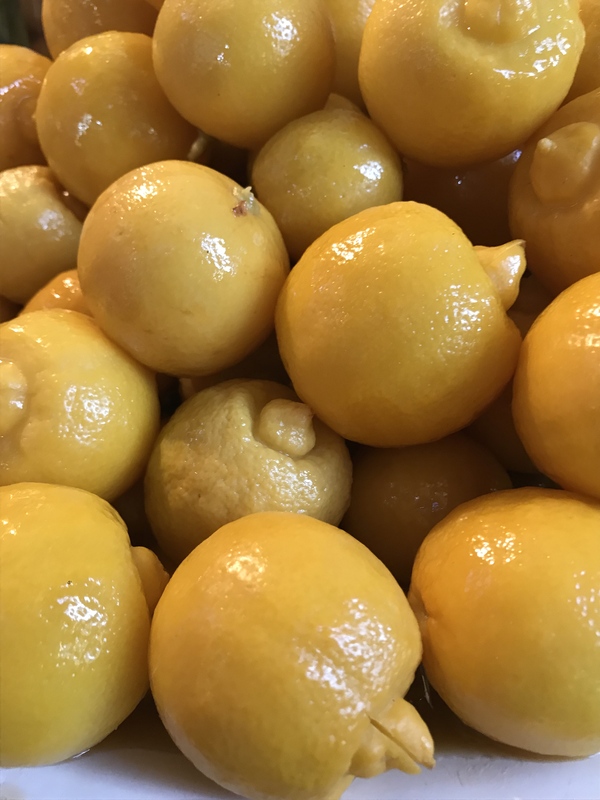 Everything from spices to herbs to fresh-picked fruits make their way over cobblestone plazas to the open markets or through winding alleyways to markets inside. Trucking fresh food into the medina on a busy market day. Spices become art forms as conical shapes in colors of the Mediterranean stand tall awaiting shoppers looking for such delicacies as cumin, coriander, turmeric, and cinnamon. Cones of spices form a backdrop for open bags garlic and crushed ingredients. Herbs aren’t packaged in plastic, as we may see in the U. S. They’re more likely to be found in armloads — thick, green, and aromatic. Outside the medina, a seller of herbs awaits customers. Ready for purchase during Ramadan (May 17 to June 14, 2018) are sweet treats for the season. Of course, those who fast wait until evening to dive into these goodies. Bowls and platters hold sweets for Ramadan in this medina stall in Marrakech. Going to the medina with Chef Joanne Weir meant frequenting her favorite places. 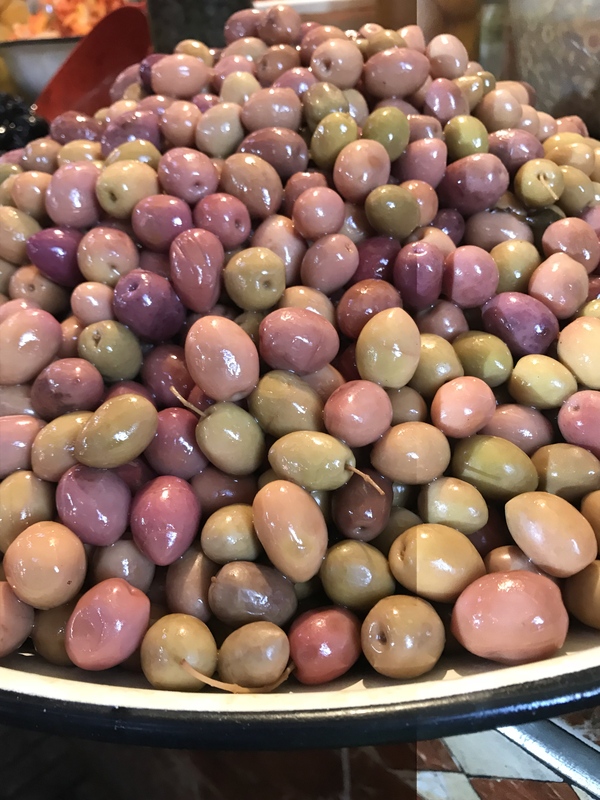 Like this booth filled with preserved lemons, onions, and olives of various shapes, colors and sizes literally overflowing their massive bowls. Olives, lemons, spices, and preserves — a colorful stall in the Marrakech medina. And if we had needed eggs, we could have bought them . . . with the chickens as well. Rich brown dates begged to be touched — so we bought some and ate them while we walked! Community bread oven with baker inside. Flat breads cooling near one of many community ovens in Marrakech. Spinning werqa dough, a dough used for making pastilla. 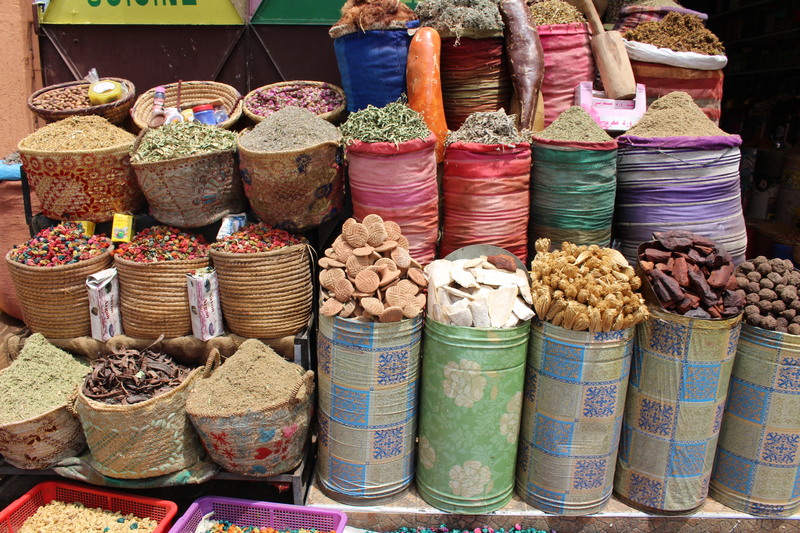 Every turn in the medina market offered a different glimpse into Moroccan culture and cuisine. How grateful I was for the opportunity to shop for fresh goods in a truly remarkable place: the Marrakech medina! And to see more posts on this exotic, fascinating country, click on Marvelous Morocco. This entry was posted in Food, Marvelous Morocco, Morocco, Travel and tagged food market, herbs, Marrakech, medina, olives, spices. Bookmark the permalink. Wooooowww. I luv your blog the places and the different foods is dope. Hopefully one day I am able to explore too. Hope you get to Marrakech someday. It really is a high in many ways. I’m loving following you and your cooking exploits. Such rich colors. Marrakech from the armchair. And I’m so glad you’re enjoying our trip to Morocco. So many colors, sites, sounds, tastes! I really need a return trip to savor more. Appreciate your comment. More posts to come. What a great post! I will be heading there this year and so very excited. Thanks for sharing ! You are in for a treat! It’s a beautiful country with well-prepared food — a true feast for the senses. We loved our strolls through the medina just so we could look at market places and food stalls. Fascinating! I could take a virtual tour of Marrakech medina through this post. Loved every minute of it! Thanks so much. Morocco is so colorful, so interesting. And even though most people did NOT want their pictures taken, I was able to grab a few shots without anyone knowing. I wanted to respect their culture but at the same time, share this place with many. Hope you enjoy the next posts to come. Great pictures Rusha! They make me want to go back and take everything in slowly. We did have a wonderful experience! You’re so right, Suzanne. I’d love to take longer looks. I’m jealous of Joanne Weir who has been at least 10 times to this beautiful place. It’s really left an impression on me. Thanks! The food itself was truly gorgeous. I had no idea what to expect, but once I arrived, I could tell the food was central to understanding the culture of this country. And I loved everything I ate! Thanks so much. It was a pleasure taking pictures. But I learned that I’m really not all that quick. When we walked through the medina, I was fearful of tripping over something. But I really, really wanted shots of that gorgeous food. Glad you enjoyed! Thanks, Cindy. The whole medina was one color palette onto which I do believe every color was represented! And I love walking through farmer’s markets and food stalls everywhere! What wonderful pictures! I should never have looked at this prior to cooking my very mundane supper. It has left me very frustrated. Don’t be frustrated! We all have “regular” food at home, and that’s why travel allows you to see something extraordinary. I will say that the Moroccan food we ate was all quite good — fresh, colorful, well-prepared. I’m thinking they have a handle on how to eat healthy, and there are times I’m not so sure we in America do. Just an observation, though. Thanks so much for taking a look! Thanks for looking at the pictures of the glorious food in the medina! I loved that part of the tour. I took a few pictures of you guiding us, but none were as flattering as I would have liked. I guess I was snapping too fast! I’d love a return trip to Morocco — if nothing else, just to have a pastilla again!! !